Like every self respecting yuppie Indian, who was exposed to the wonderland that is Goa at a young age, I come to consider it my second home. A Goan may frown upon this notion or ignore it altogether, but for me the feeling of belonging in Goa is so complete that, I in turn frown upon the ‘other’ tourists. So leaving this merry-go-around of who the state belongs to, let me get down to business to talk about one of my favorite places to eat while I’m there. I generally avoid the Calangute side of the beach like the plague because it is so packed with tourists at any time of the year. Hordes and hordes of buses will dump their beach hungry populace there and to cater to their needs the area has become a densely populated commercial hub. But I must trudge my way through the fat man in a baniyan and the lady with the wailing kid and the beggars who plead with interesting British accents and the Romeo’s basking in their ditty underwear to reach the sand covered steps of solace that is Souza Lobo. Souza Lobo has been around since 1932. (The restaurant, not the lady – bless her soul). By the number of locals as well as tourists who eat here, they seem to live up to their USP of ‘Traditional recipes live here’. 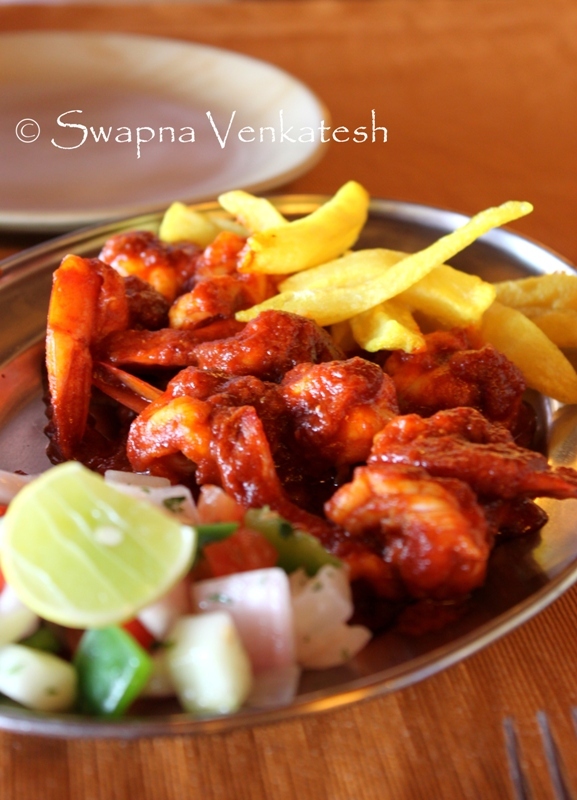 They are open from 11am in the morning and continue dishing out succulent seafood and Goan delicacies till midnight. And if you intend to come during rush hour – be prepared to wait in their patio till your number is called out. No, Seriously. In the ten years that I have been coming here, I have spent considerable time and consumed innumerable drinks in the patio, waiting for my turn to eat. No Regrets! I must have easily eaten my way through their menu over the years, but I will focus on what I had on this trip. (i.e. I do not have pictures to tell the earlier stories in a compelling manner!). Let’s start with a beer shall we? 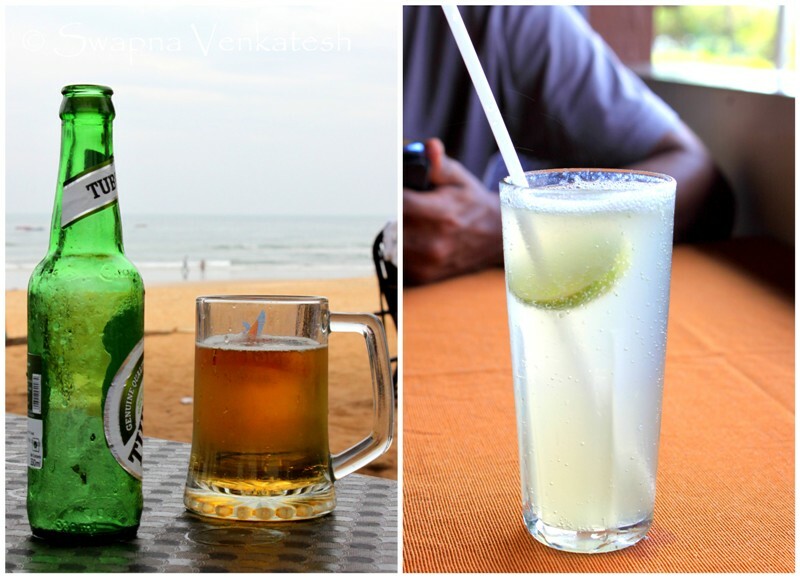 (In Goa for us, every meal starts with a beer. We may move on to something that rocks the boat a little more over the day, but beer will be the staple.) Unfortunately on this trip the famous Goan beer ‘Kings’ was nowhere to be found. Apparently the supply has stopped and they doubt it was sell again. (I can almost hear the screams of agony from my Kings-loving-friend Shwe!) The old times are a changing I guess…sob sob. Thankfully the Prawns stuffed Papad was still the same old glorious accompaniment to the beer. Now this is a starter that I have seen only in Goa. 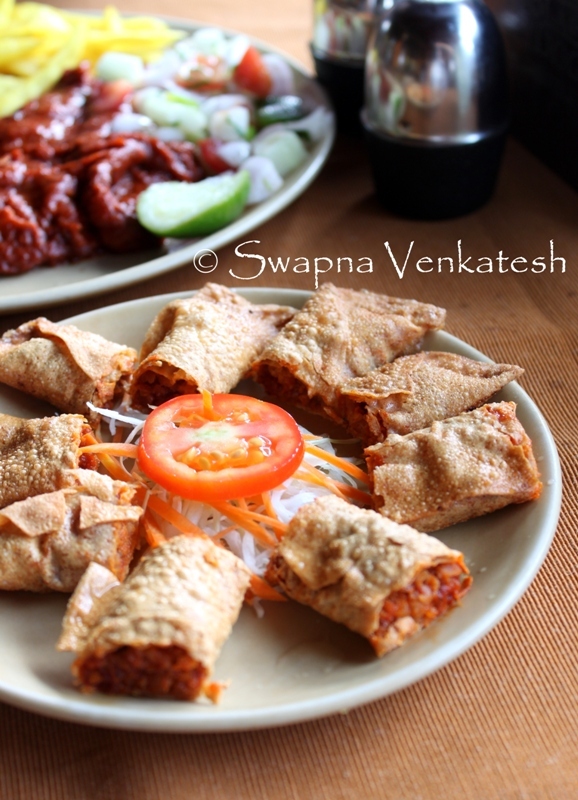 They have little shrimp which are minced/ pounded with some hot and sweet masala, stuffed into the ubiquitous Lijjat Papad which is then formed into a kind of spring roll and deep fried in oil. Heaven in every bite. I can polish off a million plates, but I always show some restraint because there are so many more things I need to eat. Yes, it’s a ‘need’. There’s a standard ‘Goan Masala Fried’ header in every menu. Under this you can club all the varieties of seafood and affix the GMF to it. The Goan Christian style of cooking is heavily influenced by the Portuguese. So the main souring ingredient used is Vinegar. The said masala (Reicheiad) is a combination of fiery dried red chillies soaked in vinegar and ground with other spices like coriander, turmeric and cinnamon with ginger and garlic thrown in. This is a fantastic masala for seafood, as the sweetness in the seafood balances out the tang of the vinegar and the spice of the chilies. You can choose to have it deep fried or tawa fried or rava fried, the key word being fried. It looks like a red flag, but I must admit I’ve never suffered any dire consequences after eating it. So yes, we ordered the GMF Prawns and the GMF Fish. Both were served with the house salad and a wedge of lime and were excellent! My main course staple in Souza Lobo is always Prawn Curry and Rice. 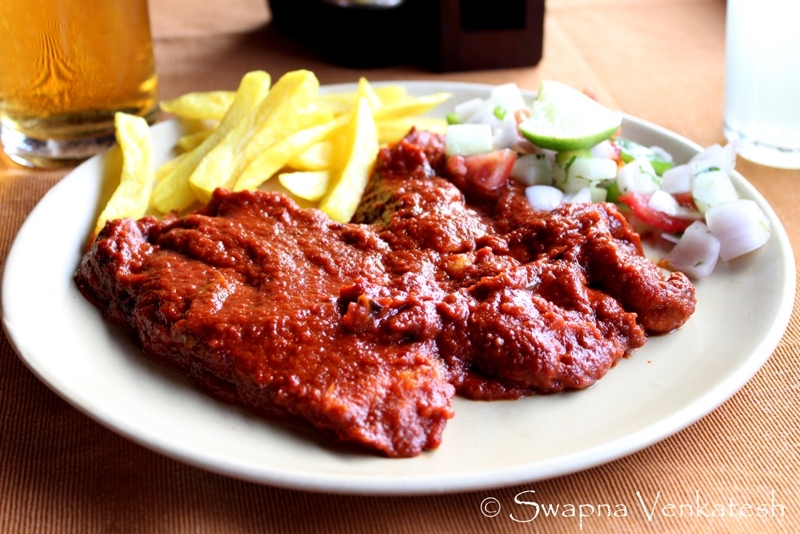 On a special occasion I am partial to the Whole Tandoori Pomfret or Baby Kingfish. It’s a glorious sight to behold – served on a large platter with the fish carved out to look like mini waves! The Kingfish is unique to the West Coast of India. The flesh is meaty and firm and therefore holds very well to being grilled or made into a tikka. 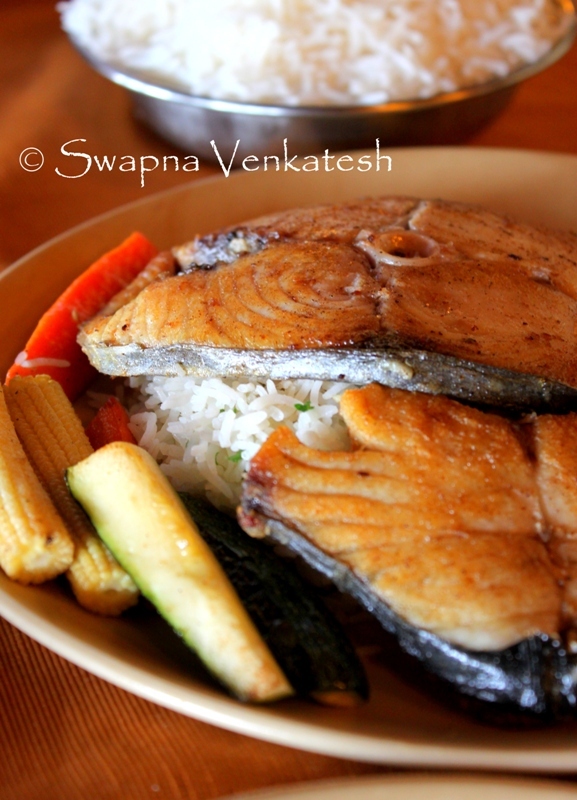 The co-resident loves Kingfish Tikka, but today he settled for the Grilled Kingfish served with some veggies and rice. I happily tucked into my prawn curry rice which is slightly different than the way they serve it further down the coast in Karnataka or further up the coast in Maharashtra. 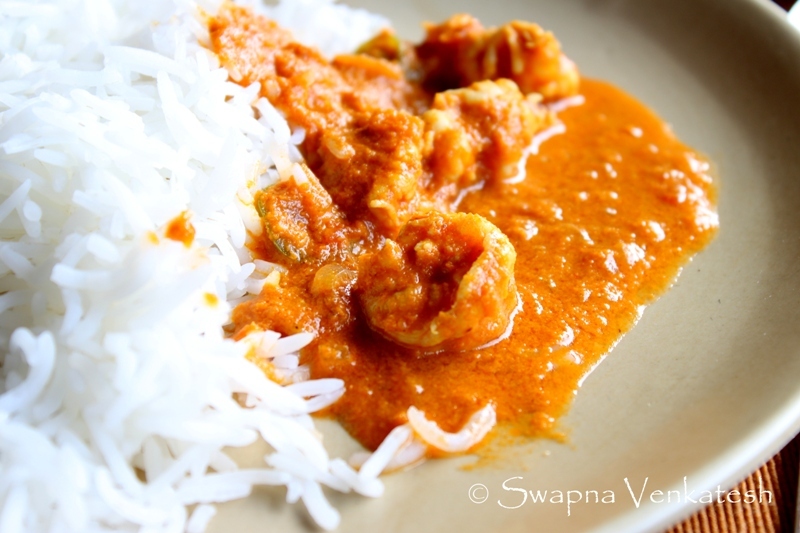 In Goa, the prawn curry has more turmeric, is less spicy and the curry itself is thicker that it’s neighboring coastal states. I’ve formed a stage OCD type of habit where my first and last meal of my holiday in Goa HAS to be Prawn curry and rice. So far the Gods have been kind and let me keep the peace! Souza’s has many more delights you can order – some fantastic fried Calamari, Crab Xacuti or even Lobster Thermidor. Or you can try their Pork Vindaloo or Goan sausages or Sorpotel. If you are allergic to seafood or your religion doesn’t let you eat Pork, there’s always the boring mutton and chicken dishes. And if you are a Vegetarian….hmm… Souza Lobo has something for you, but I apologize for this post. Clearly I have never tried anything vegetarian on the menu (except steamed rice) to even talk about it! There’s also the standard desserts of Goan Bebinca, Dodol, Caramel Custard, Crepes and some Cheesecakes and Ice cream. But I never have space for those, because I’ve eaten a mountain of seafood before I even glance at the dessert section! For entertainment, Souza’s has a live band playing every night. (Maybe they will even serenade your date if you ask them to…I’ve never tried). But most of the entertainment comes from the ocean that the restaurant opens out to. During the day, the crowds will entertain you and you will be thankful for the courtyard that offers you shade and a nice breeze in the blazing heat. If you come in the evening, you can choose to sit on the beach under the stars and hear the wave’s crash on shore as you chomp into a tiger prawn. My kind of heaven! I don’t really know if this is an objective review. The familiarity of the place might have worked its magic on me over the years or maybe the salt content in the air is so high that it makes me delirious with joy. But Souza’s has never disappointed, and that kind of record in 10 years is something only veterans can wrestle for! Price Point: Soups and Salads from Rs.135-350/-, Starters from Rs. 100-500/-, Mains from Rs. 265/- onwards, Mixed Grills Rs.850/-, Desserts Rs. 160-265/-. Credit cards are accepted. I don’t remember if they have Service Charge. Shyte.. completely forgot about you being in Goa..! Souza Lobos used to be where I went to pay homage at least every trip, but having lived in Goa for 3 years now and thanks to friends who have been here longer we've managed to sniff out some of the tiniest places that serve up the most awesome food. 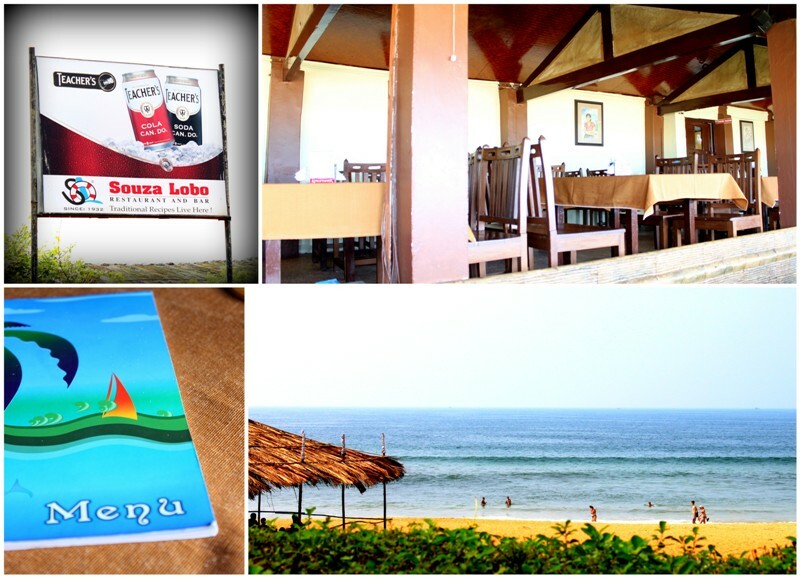 Souza Lobos is good, but caters too much to the general palate, mellowing and evening out spices and not staying true to the authentic Goan fare..